April's Little Family: Just Like Grampa. Casey has his own 'kid sized' hat, but it just won't do. He needs his Grampa hat for throwing rocks in the pond! p.s. More WW here & here! p.p.s. Don't forget to enter my Father's Day Giveaway!!! How cute. I hope he can see well enough out of the hat so he doesn't end up in the pond! Too cute. Love when kids try to imitate the people they love. So cute!! My lil men love wearing big men hats too! that is so funny because my little man does the same thing! he wont wear his hats, but give him an adult one and we can't get it off!! 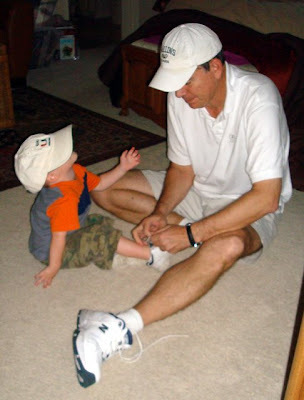 I just love little boys in baseball caps--whether they fit or not! Of course, how could he not love Grandpa's hat? !